I'm so happy I jumped on the Sew Americana tour this year! I've just loved all the inspiration and beautiful pieces I've seen this year, and I'm excited to share my sewing once again, as well! Not to mention my adorable kids. ;) Usually my girls are the subject of my blogging, so now it's the boys' turn! They are best buddies (most of the time) and I love seeing them together in matching outfits, while they'll let me dress them that way! E just loves his "BAYpee" brother. 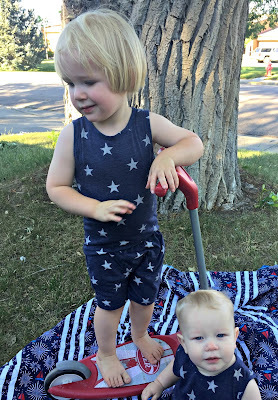 Summer clothes are so much fun to sew - easy, casual, light! 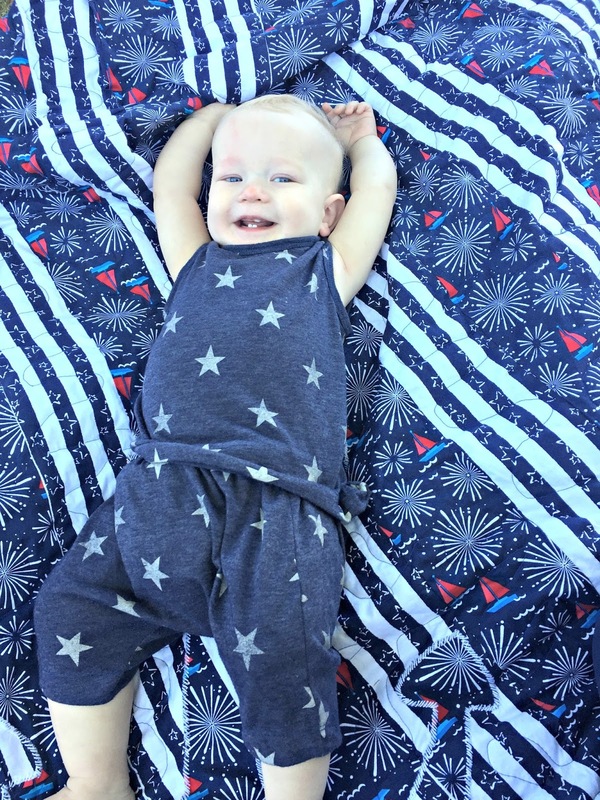 Since my boys are so small, I love pieces that can double as PJs - they love staying comfy. I love having matching sets of tops and bottoms, because it makes getting them dressed (for bedtime, or for playtime!) so much easier. I've kind of been in love with tank tops on my baby, and I've discovered that the On Your Mark tee from the Race Day collection by Kelly J Designs makes a wonderful tank top. The front has some great color blocking, but if you use the back piece (with the front neckline traced on one) twice, it makes the perfect fitting solid casual tank. Pair them up with some Harem Shorts by Little Kiwi's Closet, and you have a great casual outfit or pajamas in under an hour! I think I made both sets in 2 hours, print to final hem, and that was with the usual kid-terruptions. The quilt they're sitting on is my version of the Shiplap Quilt by Rachel Rossi Designs. 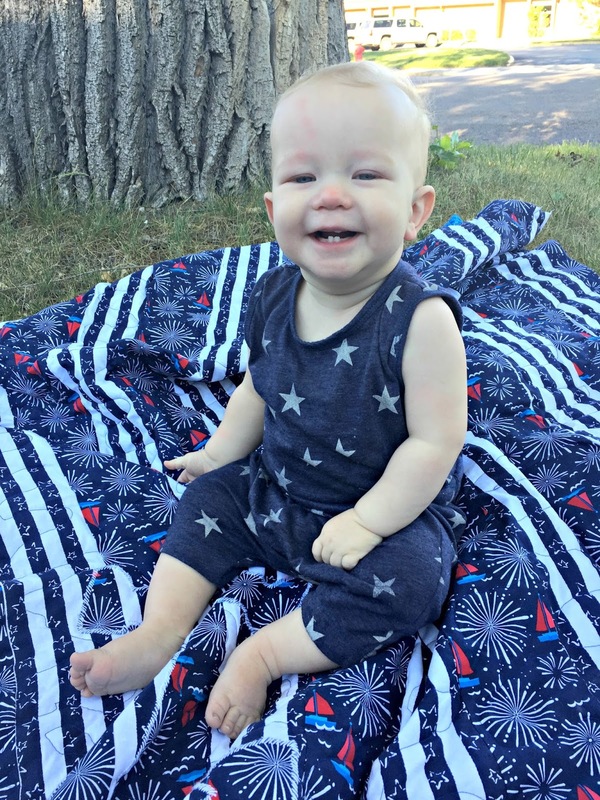 The Independence Day themed fabrics (from Walmart) provide a perfect backdrop for these summer outfits, and the anchor applique in the pattern continues the nautical/summer/Americana theme. And how about that (accidental) prop? E hardly goes anywhere, in or out of the house, without his beloved scooter - he flies down the sidewalk half the day, and when it's time to come in he drags it inside and zooms up and down the kitchen! This boy was made for summer. Be still, my heart. 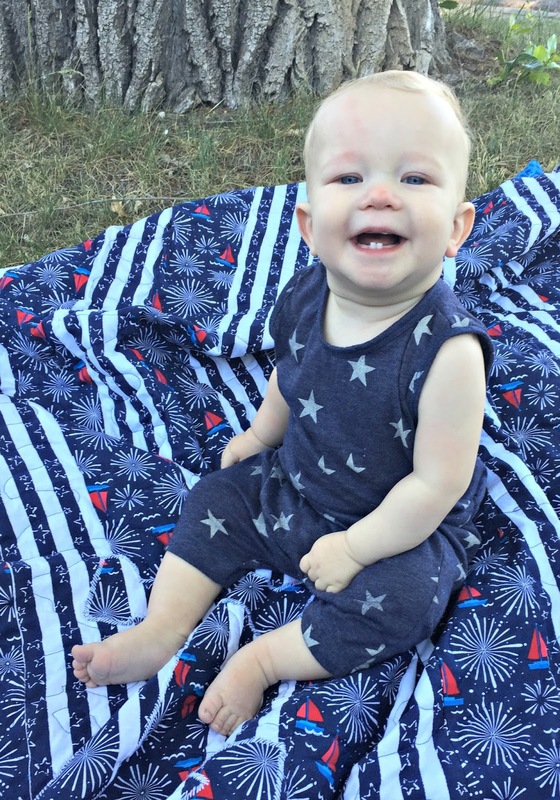 As much as I miss the toothless grins, those first few teeth are so precious - and make for the best photos! Don't miss a stop on this tour. It's so packed with red, white, and blue goodness! That poly blend looks amazing! Your kids look so cute! I love matching sets, too. I haven't delved into sewing for my little one, but you're making me want to start! Thanks!! I love sewing for my kids, I only recently started sewing for me but I still love children's clothing so much. The fabric is really awesome, it is so soft. 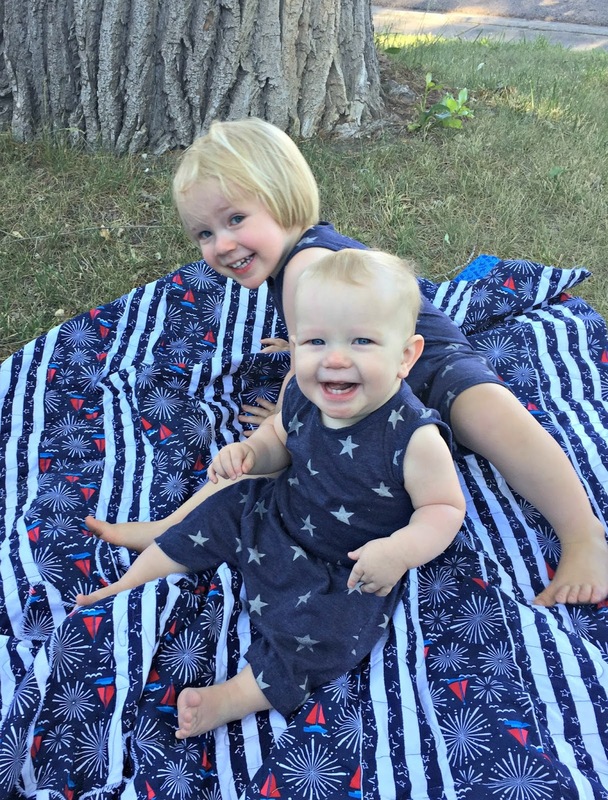 Your boys are adorable, and that fabric was a perfect choice! 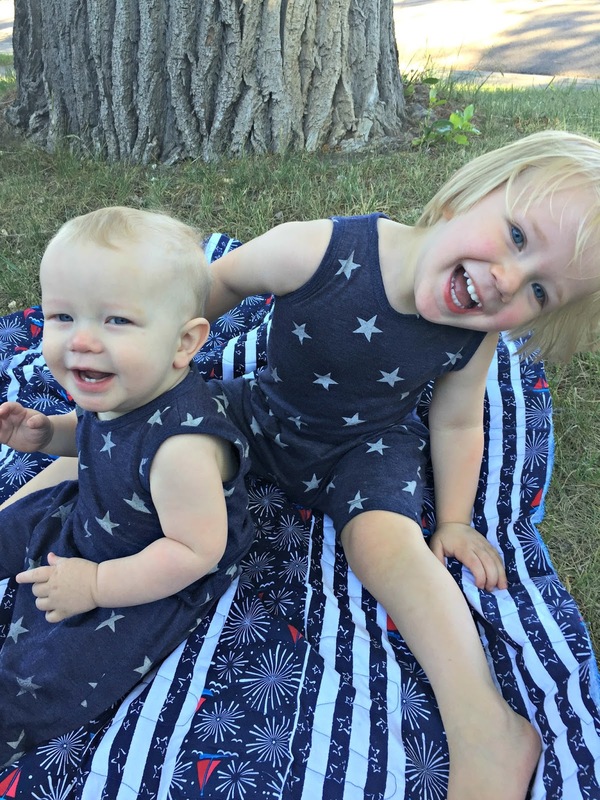 I never sewed for my kids when they were this little, and now I wish I had. Great job! The boys are so cute in their matching outfits, and love the quilt you made, too. It is beautiful! Thank you! I wasn't sure about including it because my free motion skills are lacking but it provided a great prop, and they liked sitting on it way more than our grass! It's so funny introducing babies to that texture. Such cuties! I'm sure they loved the attention. Thank you :) Oh, they did! When they weren't trying to run (crawl) away, anyway. The whole ordeal-I-mean-shoot was just a big game! 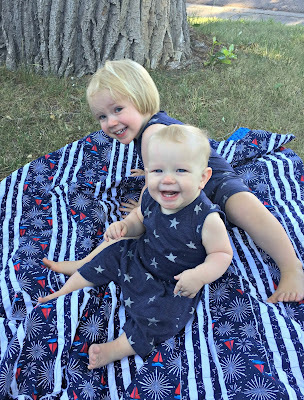 The quilt is great and the boys are so cute! 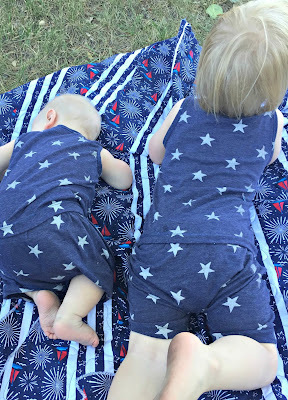 I love that navy with white stars print for them! Thank you! I'm really loving star prints for some reason right now!